In this video, Sculptor-Engraver Phebe Hemphill discusses her work on the Lowell National Historical Park Quarter. More than 2,600 people, including 1,700 school children, gathered at Lowell Memorial Auditorium in Massachusetts to witness the launch of the United States Mint’s newest quarter honoring their state. 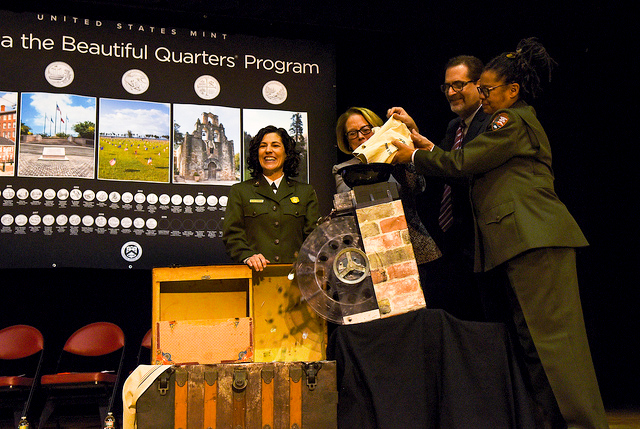 The Lowell National Historical Park quarter is the 46th coin in the America the Beautiful Quarters® Program and the first quarter to be introduced into circulation in 2019. The Lowell High School Air Force Junior ROTC presented the colors, Lowell High School Senior Class President Eunice Tabea led the Pledge of Allegiance, and the Lowell High School Chorus sang a beautiful rendition of the National Anthem. To highlight the Women and Work theme, Lowell National Historical Park invited several female community leaders to emcee the event, including Lowell City Manager Eileen Donoghue, Chief Executive Officer of Community Teamwork, Inc. Karen Frederick, Executive Director of Coalition for a Better Acre Yun-Ju Choi, Chancellor of UMass Lowell Jacqueline Moloney, and the Superintendent of Lowell National Historical Park Celeste Bernardo. The audience was treated to a performance by the Lowell High School Band playing “Mills on the Merrimack” while a video story of mill girls played on the projector screen. Former U.S. Representative Niki Tsongas addressed the audience, along with the Deputy Regional Director for the National Park Service Northeast Region Rosalyn Fennell. Landry presented the National Park Service with the traditional shadowbox containing quarters from the first day of production from both Philadelphia and Denver. He also participated in the ceremonial coin pour with Superintendent Bernardo, Congresswoman Tsongas and Deputy Regional Director Fennell, pouring quarters into a water wheel emptying into an authentic steam trunk. Jeanne D’Arc Credit Union in Lowell, Massachusetts, was on site for the coin exchange following the launch ceremony. The line stretched around the auditorium, with Jeanne D’Arc exchanging $24,000 in quarters in less than an hour. The U.S. Mint also hosted a coin forum with near record attendance of 103 people on Tuesday, Feb. 5, at the Lowell National Historical Park Visitor Center. U.S. Mint and National Park Service representatives participate in the ceremonial coin pour. In honor of the 2019 Lowell National Historical Park quarter, we launched a new game, Textile Tales. This ‘Choose Your Own Adventure’ game allows students to explore the history of Lowell and the Industrial Revolution. 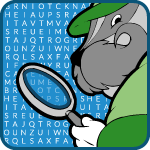 Try your hand at finding key terms relating to Lowell in the U.S. Mint’s online twist on the classic word search game, Word Quest. This game is a great supplemental tool to reinforce key terms for students studying the history of Lowell and its significance to the American Industrial Revolution. 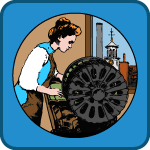 Technology and Labor Reform: The Role of Lowell in the Industrial Revolution (Grades 4-6): Using the 2019 America the Beautiful Quarter about Lowell National Historical Park in Massachusetts, students will learn about the history of the Lowell textile mills and explore their significance to the Industrial Revolution. Tsongas Industrial History Center Lesson Plan: From Farm to Factory: The Nutter’s Workday (Grades 3-6): Life changed dramatically for those who left family farms to work in the growing mill cities of New England. Follow Emily and Edward Nutter through a typical day on their farm, and a typical day in the factory. Students will learn about both ways of life and compare them with their own lives today. Tsongas Industrial History Center Lesson Plan: Decide Eliza Paige’s Future (Grades 4-8): Students use the web-based Bringing History Home – Decide Eliza Paige’s Future to learn about the lives of mill workers in the early industrial city of Lowell.